The Wellness Teas in The Irresistibles! 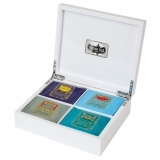 box set, perfect for trying our famous Kusmi Wellness tea blends for yourself, or to give as a gift. 6 irresistible blends that make this set a true focus on well-being. Containing 24 muslin tea bags, an assortment of our famous Wellness blends: Boost, Be Cool, Detox, Sweet Love, Euphoria and Algotea.